Vacillating between anthropomorphism and a playful look at bats as bats, Bats at the Beach is a fun read for kids ages 4 to 8. 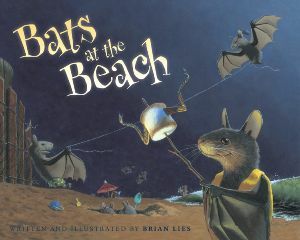 Some of the images are designed to make kids squirm — marshmallows made of bugs, for example — but all in all, most kids will enjoy the storyline of bats having a holiday by moonlight on the beach. Given how reviled bats are in our culture, I think this book by Brian Lies does a nice job of portraying bats in a positive light. His bats express emotion, care for family members, and have fun, allowing kids an opportunity to relate. For fans of the book, Mr. Lies has two more recent titles featuring bats — Bats at the Ballgame and Bats at the Library.